In recent years the Eastern Mediterranean has increased its international strategic importance following significant discoveries of hydrocarbons. In this region the recent offshore findings of natural gas are radically changing its geostrategic and economic status. But before achieving the ambitious objective of becoming a net exporter of energy, the countries of the Eastern Mediterranean, and Cyprus in particular, must confront regional challenges and interests of the major powers in the area – be they economic, politico-strategic, or due to the required energy infrastructure. Two years after the great discoveries of the Leviathan and Tamar fields off the Israeli coast in 2009, it was, in December 2011, Cyprus’ turn. The U.S. company Noble Energy reported an initial discovery of offshore gas in block 12 of Aphrodite, with an energy potential estimated at between 5-8 trillion cubic feet (140-230 billion cubic meters). Evidence suggests that this area is an extension of the Levant basin: it is still the subject of an initial exploratory phase, and these initial estimates are considered conservative, with the prospect of rising in the coming years. There is therefore a potential wealth for the island of enormous proportions. 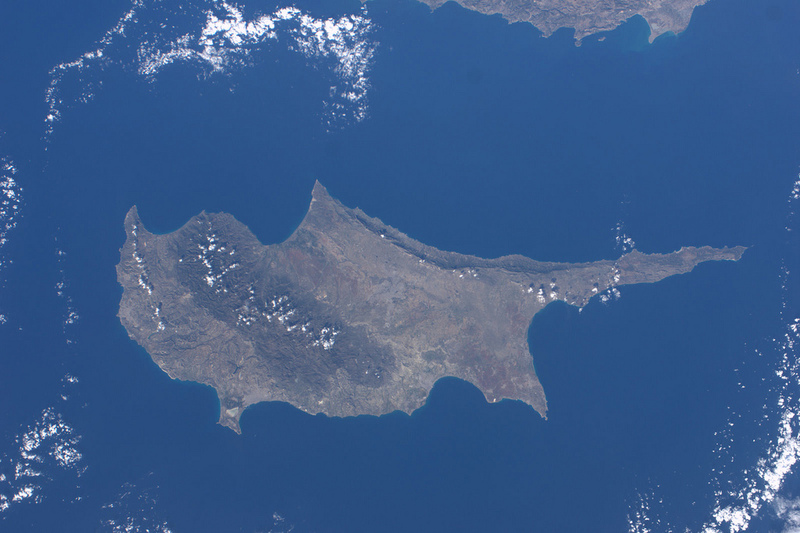 According to some experts, Cyprus could potentially be sitting on a goldmine of at least 60 trillion cubic feet (1.7 trillion cubic meters) of gas. Not considering the possibility of petroleum it could generate revenues of up to $400 billion once commercially exploited. The declared objective of the government of Nicosia is to use the geo-strategic position of Cyprus, between Europe and the Middle East, to make the country a true energy hub, with a central role in commercial transit and in the provision of European energy. This is a perspective, however, that does not consider the tensions and several unresolved questions that could hinder the energy development of the island, essential in reviving an economy itself in deep crisis. First, the strong political destabilization resulting from the 1974 Turkish military invasion, which produced a de facto division of the island between the Turkish-Cypriot north and the Greek-Cypriot south. The discovery of energy resources in the southern part of Cyprus, as well as an absence of results from research conducted thus far into the offshore areas of the north, have added a new and relevant source of friction in relations between Nicosia and Ankara. The island’s peculiar political situation could therefore constitute a brake on the development of the country’s economy, capable of affecting decisions regarding investment by foreign companies, especially those who have strong interests in Turkey. The latter, in fact, threatened repercussions for those companies that intend to enter into agreements to exploit resources with the Cypriot government. Such is the case for Eni S.p.A. which has seen the suspension of all projects undertaken with Turkey, due to its exploration agreement signed with Nicosia in January. Ankara, in fact, maintains that such energy resources are located in international waters and that they should benefit all of the island’s inhabitants, and not only Greek-Cypriots. Turkish interests, profoundly connected to energy, therefore emerge. Furthermore, relations between Cyprus and Israel, in particular those relating to a possible project for the liquefaction of gas for export, feed the prospect of an energy partnership. This could provide an alternate route for transporting gas to Europe and Asia, obstructing the great Turkish mission to become a regional energy hub. According to several analysts, this prospect was one of the reasons behind the rapprochement between Turkey and Israel, which enabled the former to maintain its centrality as the country of transit, and the latter to optimize conditions for its gas exports. While in the long-term the economic advantages of cooperation between Nicosia, Tel Aviv, Athens, and Ankara might be more convincing, in the short-term, energy pressures feed tensions in an already established hot spot. 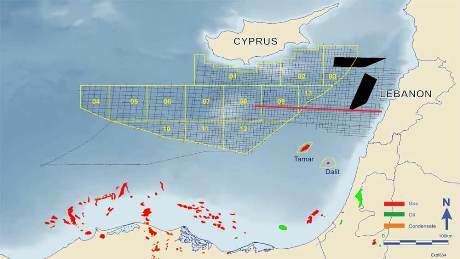 It is probable that Turkey’s firm stance on the Cyprus question is one of the reasons behind the Russian decision not to accept the bailout plan hastily proposed by Nicosia in exchange for licenses for the exploitation of gas fields. To this must be added, among others, the European position and the special relationship between Berlin and Moscow, sealed by the agreement on the Nord Stream gas line, which might have suffered setbacks if Putin had decided to approve a bailout plan for a member country within the EU. Moscow’s position, then, is understandable when considering the multiplicity of interests that the country shares with other regional players, such as Germany, Greece, and Turkey: these can be safeguarded only by a strategy of ambiguous realpolitik. Although the issue of the Cypriot bailout has put pressure on the relationship between Nicosia and Moscow, it is difficult to imagine a rupture of relations between the two countries, instead of a redefinition in the interests that still bind them. Moscow, in fact, has long-standing ties with the island of Aphrodite, ranging from banking and finance to real estate and military strategy. There are strong suspicions, for example, regarding the role played by Cyprus in the trafficking of weapons from Russia to Damascus. Brussels, for its part, seems determined to impose comprehensive change on the Cypriot business model and on its banking system, thus affecting its status as a tax haven for the offshore investments of Russian magnates. Discoveries of gas in the Cypriot Sea represent a great opportunity for Europe to diversify energy supplies, with respect to Russia’s dominant role. Cyprus’s economic problems, however, which have led to the forced levy on bank deposits, also herald strong domestic discontent: the EU should not exacerbate the economic situation because, as the multiple demonstrations on the island show, anti-European sentiment is particularly widespread among the population and could become a source of political instability. This could obstruct a possible solution to the conflict with Turkey, a central obstacle in Ankara’s access to Brussels. The framework outlined above seems far from optimistic given that, at least in the short- to medium-term, the European controls on bank accounts, the withdrawal of Russian support, and Turkish pressure all clamp the island in a vice that will only increase internal malaise and aggravate the downturn in the national economy. A situation which seems as if it will not improve until exploitation of the energy resources of the Aphrodite gas field is at full capacity, something that might require several years. 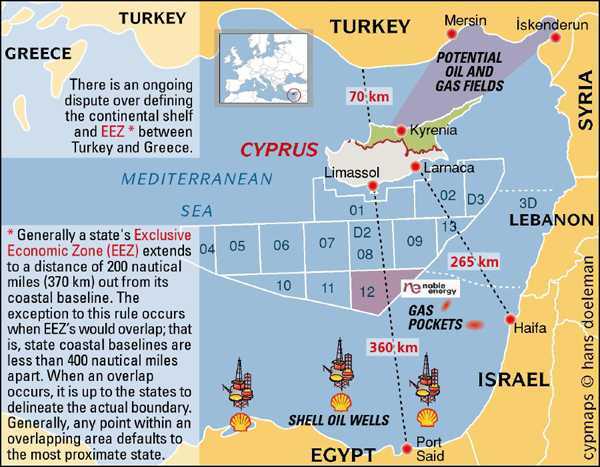 On the contrary, within an extended timescale the need for cooperation between the main players involved only increases due to pressures deriving from the stabilization of the Cypriot economy and the gradual exploitation of the rich intra-European gas fields. Turkey has already signaled to this effect: conscious of its role as transit towards international markets, Ankara has proposed to Nicosia its help in the development of gas, as long as the benefits of such discoveries should, as noted previously, be shared by all the inhabitants of the island. In conclusion, one aspect is more certain than others: without a resolution of the dispute over sovereignty of the island, an issue that has dragged on for 40 years now, eventual regional cooperation seems difficult to envisage. Chiara holds the position of Junior Analyst in the energy consulting firm RIE (Industrial Research and Energy) of Bologna and collaborates with Energy Magazine. She holds a degree in International and Diplomatic Sciences from the University of Bologna (Forlì campus). Her interests mainly relate to energy issues, including energy policies in the Middle East, nuclear energy, and the processes of public debate and consensus. You can follow her on LinkedIn and Twitter (@ orienta_giovani). This article was cross-posted by permission and appeared in its original form at TheRiskyShift.com.